Most people understand the impact that outdoor air can have on their health. From urban smog to spring allergies, poor outdoor air can make you miserable. However, many people underestimate the importance of indoor air in promoting good health. According to the EPA, poor indoor air quality can be even more damaging to your health. In fact, the agency estimates that in certain situations, air pollutant levels can be up to 100 times greater indoors. Poor indoor air quality can trigger or contribute to a wide variety of different respiratory illnesses, such as Legionnaires’ disease and asthma. Even when it doesn’t cause a specific disease, poor air quality can cause a number of irritating symptoms that will decrease the quality of your life, such as sneezing, coughing, fatigue, congestion, headaches and dizziness. Poor air quality affects thousands of Twin Cities residents and can be caused by a number of different factors. Your heating system is a major source of indoor air pollution, especially if your furnace is gas or wood-powered. Combustion byproducts, such as soot or carbon monoxide, can build up in your home over time, especially if your air filters are clogged. Outdoor pollutants can also accumulate within your home. Modern, energy-efficient homes are designed to be tightly insulated against the outside world. Although this can help you save on your heating and cooling bills, it also means that pollutants have a difficult time escaping from your home. Without a robust air purification system, these pollutants can build up to unhealthy levels. Additionally, bacteria can live within your ventilation ducts. If your ventilation system doesn’t include adequate air cleaners, bacterial spores can migrate from your ducts into the air that you breathe every day. Equipping your home’s heating and ventilation system with the right air purifiers and air filters can help reduce indoor air pollution. A complete air purification system will work with your ventilation system to provide you with clean and comfortable air. At Marsh Heating, we can help you choose the right air purifiers, air filters and air cleaners to improve your indoor air quality. 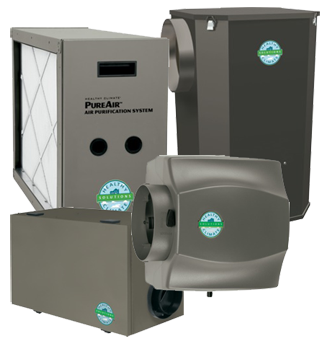 With our professional installation, you’ll be breathing clean, comfortable air in no time. Please view our line of Lennox indoor air quality products below. Click on a specific product or call us at 763-536-0667 for a FREE consultation.